Task: to create a core graphic element to base an identity on. When this project began, the international exhibition center Kazan Expo hadn’t hosted any events. 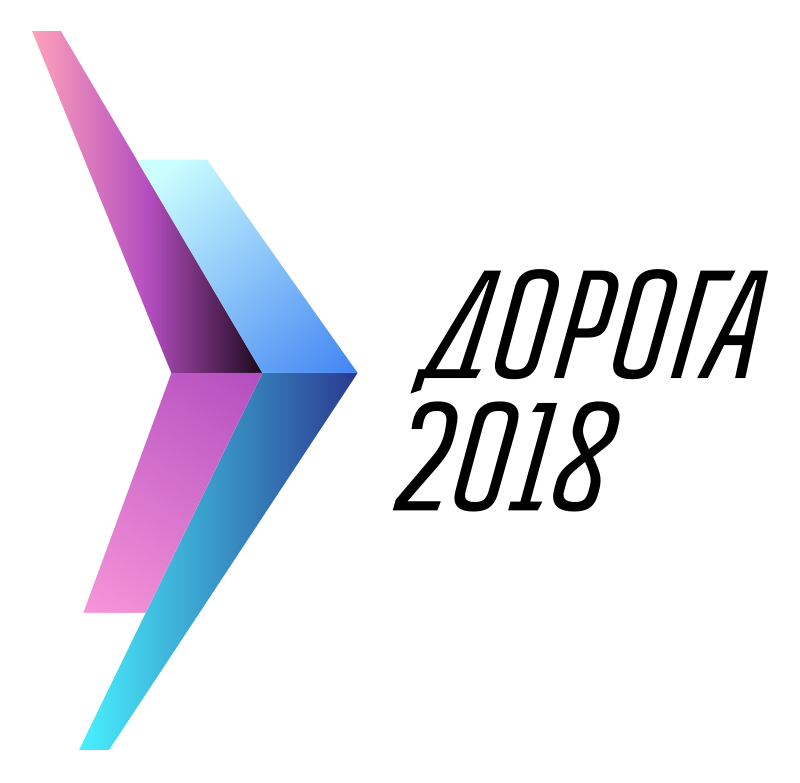 Doroga 2018 was the first expo to bring together companies which have something to do with Russian roads, including manufacturers of paving equipment, laboratories working on surface quality, and transportation experts. An event as important as this needed a solid logo. After looking at some designs provided by the client (created by the client and other designers), we decided it would be best to start from scratch and get it right. After the organizers explained what they liked and didn’t like about the previous designs, the studio’s designers got down to business and came up with some concepts. Concept 1. A typographic road-themed option. In addition to roads, this concept references the red and white signs usually used to mark detours during roadworks. Concept 2. This concept is based on road markings, but avoids the overused image of a road disappearing into the distance. The result is fresh and interesting, thanks to the new take on the gradients. Concept 3. This idea makes a clear reference to motion, with the juxtaposition of the top and bottom parts. And, of course, it hints at chevrons. Who doesn’t remember seeing these plastered all over bridges to marking potentially dangerous objects? Concept 4. Arrows are all about breakthroughs, drive, and speed. Beautiful and dynamic, this concept would stand out at any exhibition. Concept 5. Paths converging in perspective. This is speed. It’s the trailing light from cars as they fly along. What do we need from a good road? Speed, of course! Concept 6. This type-fronted design is speedy and modern. The choppy elements resemble blueprint markings, while the colours remind us that we’re in Russia. So, six cracking designs, but there could be only one. We know which one that was, but why not test your design intuition and pick the version that the client deemed worthy for this important exhibition. The client believed that this logo was too striking for the serious business of roads. We should be looking for something a little more conservative. We didn’t know at the time, but the Doroga’s internal corporate magazine has a logo which is graphically similar to this one. And the client liked that! Good. We’re on the right track. We should definitely keep this one in mind for the future. But right now, we need something a bit livelier. The client is convinced that roads are dangerous enough as they are. There’s no need to add to this negative image. This was the design that the client went for. When work started on the final version, we thought it would be worth merging this concept with the second one to see what came out of it. Designer: We were trying to focus more on motion to make the symbol even more dynamic. The result was definitely better than the kind of thing you usually see on expo pins. 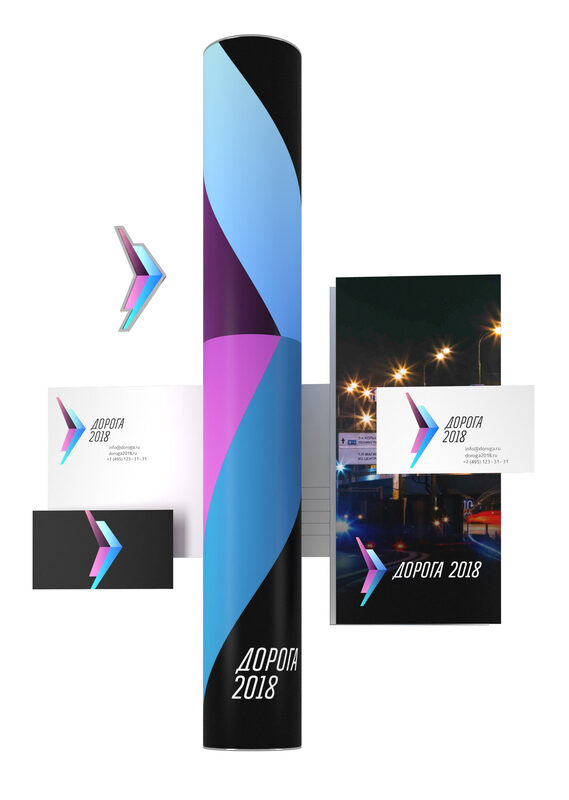 We started applying the design to other things like business cards and poster tubes. Nobody asked us to do that, but once we got started, it was hard to stop. 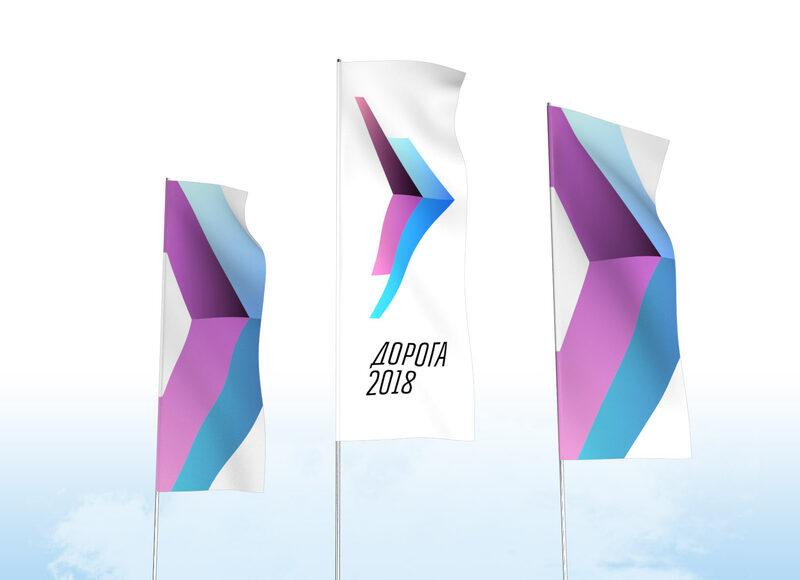 To supplement the logo, we created a design for the speaker stage and the expo flags. Finally, we came up with a full set of digits. Instead of reworking the logo every year, the client can simply change the number at the end. 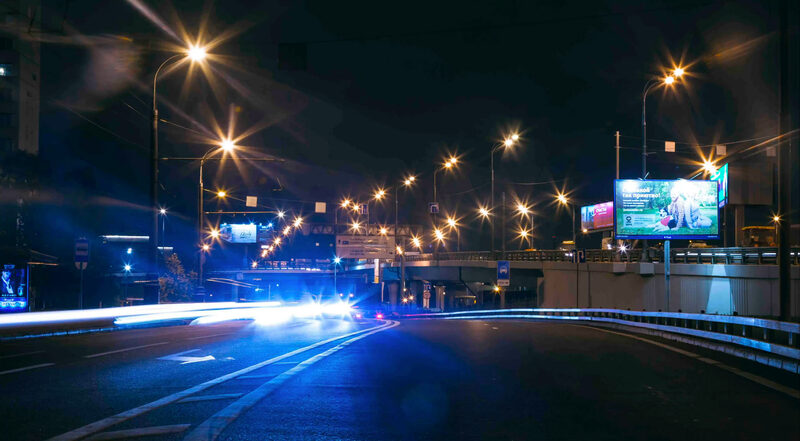 The client said that the prominence of the growing charts over the highway made them think that was less about roads, and more about consulting and analytics. The client thought this one was pretty bland. Sure, it’s close in style to Ceramic Speed, but their logo has three Es that resemble rapid air flows. In this case, the logo is much more static and, thus, less interesting.